Our Olympic size Multi Grip Press Bar has 2 grips spaced 16" and 24" apart. What makes this bar different over our Swiss and Football bar is the single bar in the middle. While pressing over head you wont have to dodge your chin around the frame. Grips are angled to take the strain off of the shoulder. When performing Log type movements, the 3" wide 3/8" thick steel rests nice on the thighs. Black powder coat, light knurl on the handles. 3/8" steel and Sch80 tubing. Thanks to this bar I can press more often with less pain. It’s also good for rows and curls, too. Don’t forget to buy collars that will fit. 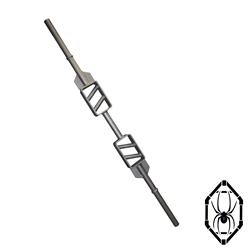 My experience is consistent with the reviews I had read and saw on YouTube: the bar is high quality and does what it is supposed to do which is take some of the pressure off the shoulder joint while performing bench presses and military presses. Also, Dean takes care of his customers. I was looking to buy this bar during Deans hiatus and had a question, which he kindly took the time to respond to. 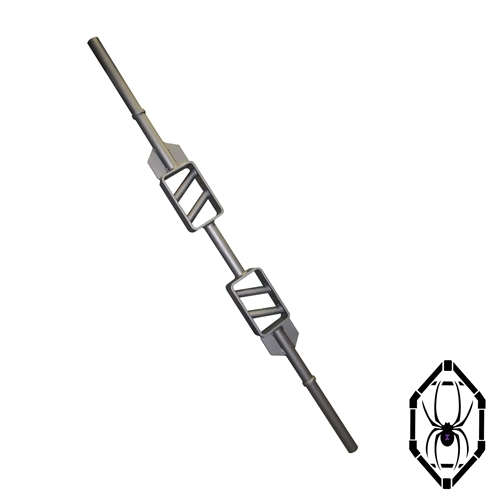 I know I will purchase more Black Widow equipment in the future and will recommend it to others. I've had this bar for about 2 years now. I bought it mainly to take the pressure of my shoulders during bench since my left shoulder is fully separated. It has been a great bar and I've been very happy with the purchase. I was worried about only two, angled grip options, but it hasn't been an issue. My shoulder feels great benching, and pressing heavy with this bar. Is it precision? No, it's handmade and I appreciate that. It does have a slight bow, it looks hand built and it's solid. All features I admire since I have a garage gym, it fits the "rugged" homemade feel my gym has. I live in Washington and had no issues with the shipping as others have mentioned. I was also impressed when the owner reached out to me personally to let me know the bar would ship sooner than my invoice said it would. Definitely plan to order more from BWTG. Bar: amazing, second to none. 5 stars. I have shoulder issues and this bar lets me press pain free. Shipping: awful, 1 star. The bar arrived damaged with three large scratches and a crushed end cap. It was wrapped in bubble wrap inside single ply cardboard. Not enough to withstand the manhandling that one might expect from shippers. But, I'm more lazy than picky, so I'll just use it as is. 10/27/17 - Dean from BWTG, I just saw this now. Thank you for the review. I try to package the best I can, shrink wrap, bubble wrap and cardboard. UPS makes mistakes, I wish you would of contacted me sooner, I could of put in a claim with UPS, gotten you a partial refund or shipped the item back to me for a replacement. Im sorry you had a bad experience with me. What a beast this bar is. Top-notch quality in the craftsmanship of the bar. The knurl on the grip handle is just right. All the welds are beautiful. Up to 4 different hand grip configurations. The powder coat finish is the icing on the cake. Just what I needed for bench pressing and overhead presses. This bar can hold some serious weight. You won't regret getting this multi grip press bar. Some serious pride in making this bar. A work of art.